Our guide to Honolulu will help you find the best frozen yogurt shops in Honolulu Hawaii. There are tons of great frozen yogurt shops in the city of Honolulu, our city guide will help you find the best frozen yogurt shops. You may have a hard time deciding what to do in Honolulu, but we make your decision easy. 1050 Ala Moana Blvd, (808) 592-9292 - The purest, creamiest frozen yogurt featuring live & active cultures that are low in fat, high in calcium with more than 40 toppings available. 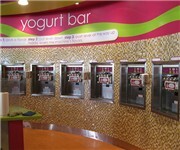 1450 Ala Moana Blvd, (808) 955-4144 - Yami Soft Frozen Yogurt Shoppe is a frozen yogurt shop located in Honolulu HI. 1450 Ala Moana Blvd - Orange Grove is a frozen yogurt shop located in Honolulu HI. 1810 University Ave, (808) 951-4444 - Yogurtland offers a tempting blend of choices, image and value – a unique mix that's arrived at the perfect time. 2490 Kalakaua Ave, (808) 922-2626 - Yogurtland Waikiki Beach is a frozen yogurt shop located in Honolulu HI. 611 Kapahulu Ave, (808) 734-2066 - Tutti Frutti is a self-service frozen yogurt cafe offering up to 50 delicious and exciting flavors and over 30 topping varieties. Ft St Mall, (808) 533-3789 - Yogen Früz provides delicious and nutritious frozen desserts, just what you need to live a healthy and active lifestyle. There are plenty more frozen yogurt shops in Honolulu. See all frozen yogurt shops in Honolulu Hawaii.